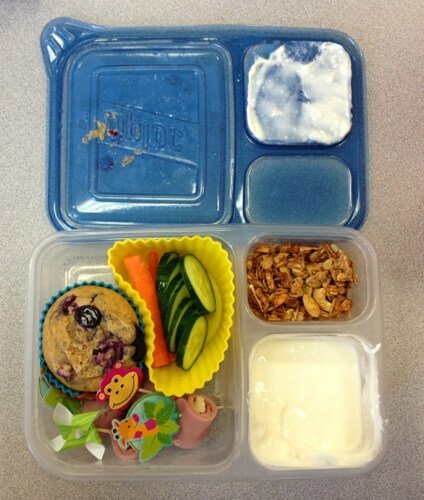 How my kindergartner’s lunch looked like right after I packed it. 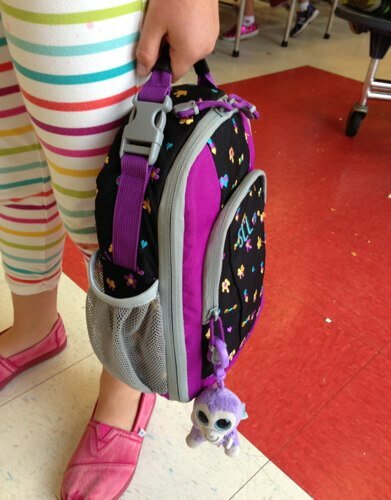 The lunch bag sits upright when it’s clipped to her backpack and when she carries it to the lunchroom. Time to dig in – as you can see I pack these lunches with 4 small ice packs in an insulated lunch bag. How the lunch looks once it’s opened. I have to say – this is closer to the original picture than even I was expecting! 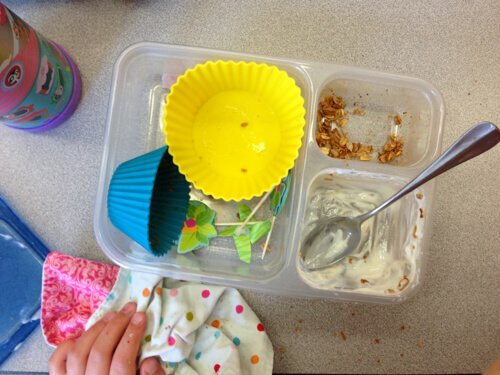 The lid is leak-proof so each food stays securely in its own compartment (if the lid is shut properly). The jumbo (yellow) muffin cup is tall enough to touch the lid so dry items stay in that spot. Mixing her granola into her yogurt and starting to chow down. :) One thing I love about this lunch box is that it doesn’t take her long to open only one lid during an already short lunch period. Time to pack up! I’ve told my girls numerous times to put that lid back on securely in case a little bit of yogurt is left in there. When my older daughter recently forgot and came home with a mess I had her clean the lunch bag herself so I am pretty sure it won’t happen again (at least anytime soon). Putting the lunch box, ice packs, and water thermos back in the bag is easy enough for a 5-year-old. So that’s all there is to it! And since I know some will be wondering :) …. 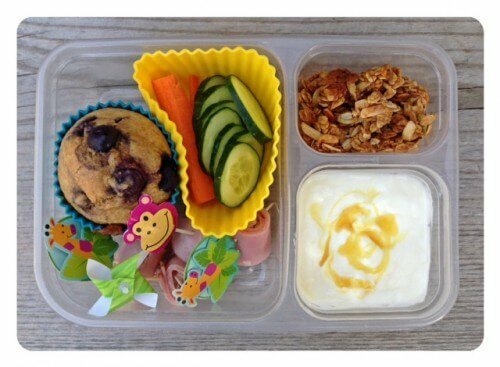 Those are Ziploc brand divided lunch containers – super cheap, lightweight, BPA-free, and available online. I have no relationship with Ziploc whatsoever. We just really like these lunch boxes. I got the muffin cups here. Here are the Thermos cup, the flexible ice blanket, and the fun character ice pack. I bought the fun toothpicks at Party City, although I’ve found cute ones at several different places including Martha Stewart Crafts, and these cute Meri Meri Toot Sweet Cupcake Picks. The lunch bag is by Lands End and we have the matching backpack that goes with it. This is the brand my older daughter has been using for almost 3 years now and it is still holding up great. 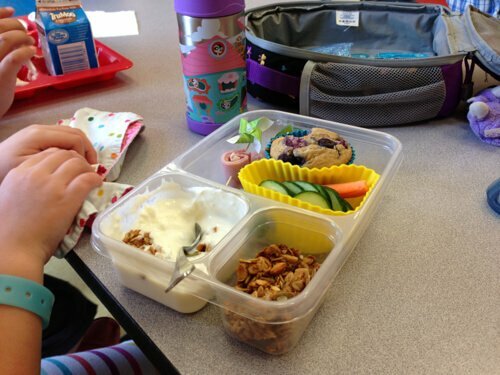 For more school lunch ideas check out my most recent School Lunch Roundup post. I know this is late, but I am, finally, giving Primal Pit Paste a shot. Just got it today and am crossing my fingers that it works for me. Is your husband still using the product and does it still work well? 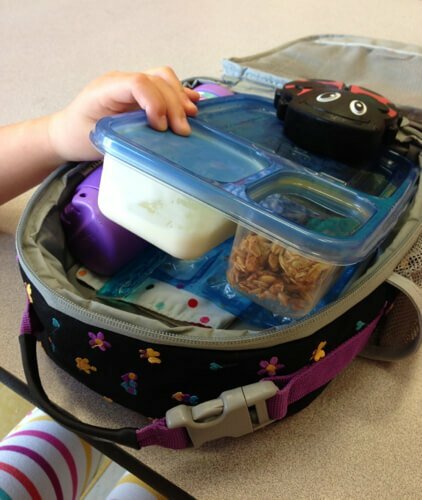 Went over to the Land’s End website to see about purchasing the lunch boxes you use. It seems like every commenter says that within 6-8 weeks the lining in these bags starts to come apart at the seams. I was just wondering if you had every experienced this happening with the ones you’ve purchases? 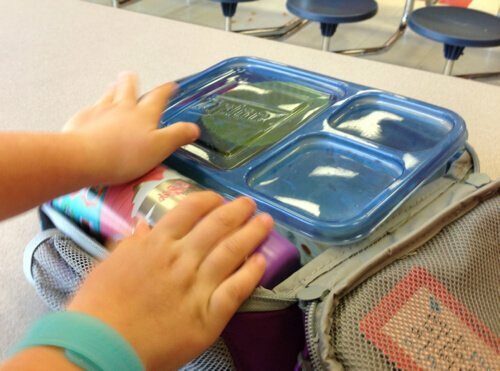 I’ve bought many of the other products you’ve recommended, all of which were fabulous, so I trust your opinion, but just wanted to double check since so many people seem to be having such a big issue with these lunch boxes. 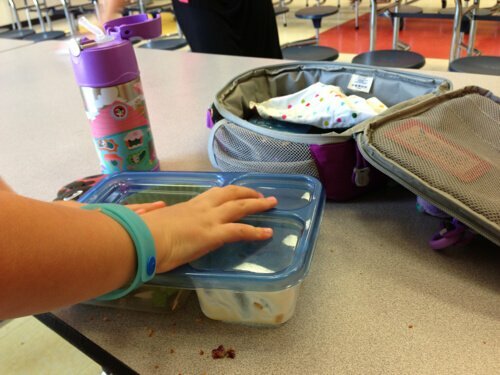 What an awesome idea to have her clean her own lunch box when she doesn’t put the lid back on! I have to wash my daughter’s a few times a week. Why have I been doing it??? Think this post is great but needs an update as these awesome ziploc containers are no longer available (sadly). I even wrote the company to beg them to bring them back, but there are no plans to do so. They were inexpensive and lasted forever and, like you said, were leak proof. Primal Pit Paste is a fabulous product! Just ordered my second batch, one jar, one stick. I like that it comes unscented, and it works so much better for me than the “industrialized” deodorant. Another product I found on this website is Branch Basics cleaning soap. It was 25% off for Earth Day so I was able to order the large starter kit. I could not believe how it cleaned my (very dirty) bathroom floor in minutes and then I could use the same solution to wash my hands. This product is the best I’ve ever seen in plant-based cleaning products. Just mix with water. INCREDIBLE!! Thanks, Lisa for sharing products that you try out then review!!! Ok where is the cute napkin from? Hello. You can find similar reversible napkins on Etsy. I bought the same container for my son as you guys and love it. However just watched a Facebook live from another blogger and use of plastic. Now I worry!